This very large heart has a globoid shape because all of the chambers are dilated. It felt very flabby, and the myocardium was poorly contractile. 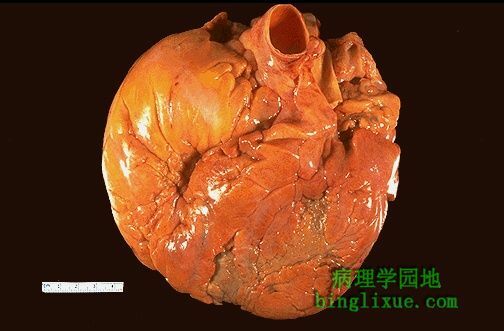 This is an example of a cardiomyopathy. This term is used to denote conditions in which the myocardium functions poorly and the heart is large and dilated, but there is no specific histologic finding.